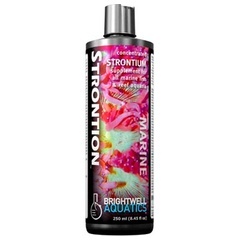 Strontium is found in the bones of fish and, more importantly, in aragonite, the mineral secreted by reef-building marine invertebrates such as corals, clams, tube worms, and their respective allies. Overall, strontium accounts for between 0.75 - 1.00% of aragonite's total mass, and findings suggest that strontium itself induces inorganic precipitation of other ions, creating abiogenic aragonite. Rapid growth rates of corals and other reef-building invertebrates witnessed when strontium is maintained at the natural seawater concentration of approximately 8 ppm suggest this element's importance in the marine environment. Advanced: Determine the strontium concentration in the aquarium using an accurate test kit before supplementing. Shake this product well before using. 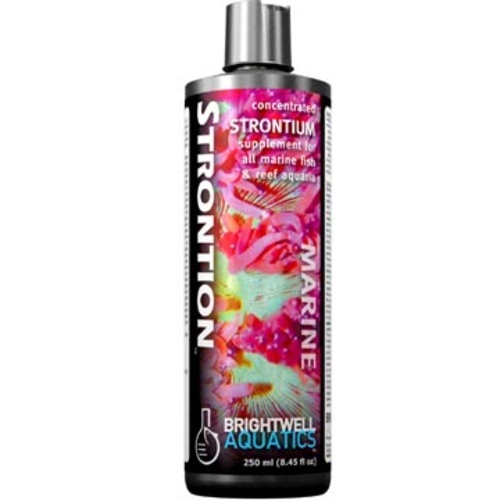 Each ml of Brightwell Aquatics Strontion will increase the concentration of strontium ("[Sr2+]") in 1 US-gallon (3.785 L) of water by 8 ppm. If the initial [Sr2+] in the aquarium is below 8 ppm, add this product at the maximum rate of 10 ml per 20 US-gallons daily until the desired concentration is attained, then dose daily or weekly as needed (see below). If not using a test kit, add 5 ml (1 tsp) of Strontion per 20 US-gallons of aquarium water in two-day intervals to maintain the [Sr2+] within the proper range. Always try to maintain the [Sr2+] within a range of +/-2 ppm. To determine the dosing rate of this product once the desired [Sr2+] has been acquired, measure the daily rate of strontium uptake (i.e. the decrease in strontium) in your aquarium by measuring the aquarium's [Sr2+] at the same time each day over a one- to two-week period. To determine the daily dosing rate (preferable to weekly dosing) for strontium maintenance: estimate the volume of water in the entire aquarium system; divide the daily decrease in [Sr2+] by 8; multiply this number by the volume of water in the system to get the daily dosage required (ml) to maintain a stable [Sr2+]. Daily dosing maintains a more stable [Sr2+] (and more natural environment) than dosing weekly, in which the [Sr2+] spikes just after dosing and then gradually decreases throughout the course of the week.